Most people know edamame as an Asian snack that is boiled, salted, and eaten at sushi restaurants, but surprisingly, there are many other ways to enjoy the good-for-you soy bean. 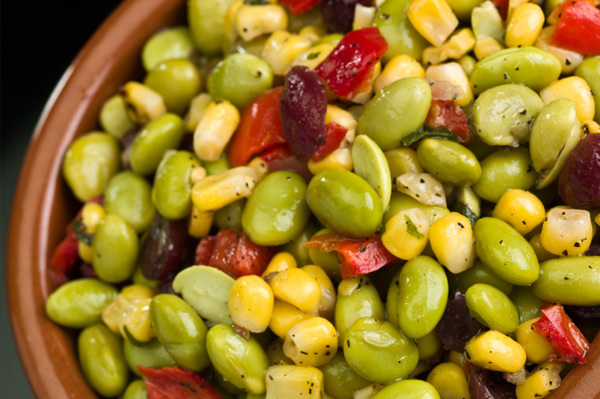 Read on for some tasty edamame recipes on what to do with edamame. Most grocery stores these days sell frozen edamame that simply needs to be defrosted and enjoyed-some brands even come pre-salted or shelled. For the majority of recipes, frozen edamame work just fine and are much easier to use. If you can find them shelled, that’s even better because then you don’t have to spend time shelling lots of beans. Be sure to use unsalted for recipes though because you don’t want there to be too much salt. Fresh edamame are fairly hard to find but you may get lucky in an Asian grocery. If you do happen to stumble across fresh edamame (also labeled as soybeans) then just boil them for 5 to 10 minutes or until tender. You don’t want to overcook them because they will become mushy, you still want a little bite to them. Besides just munching on edamame as a snack straight from their shell, there are many great ways to enjoy them. They work great as dips and spreads because they get really creamy and smooth. They also are good when sautéed and sprinkled over salads, rice dishes, or pasta. Add them to just about any Asian inspired dish from teriyaki to stir-fry and they will add a healthy and tasty flavor. Edamame also make terrific additions to a summer or fall bean salad or stew, just be sure not to overcook them so they don’t become mushy which can happen pretty easily. Finally, you can simply steam them and dress them in other flavors besides salt, like chile powder, soy sauce, fresh herbs, or a sweet and sour sauce and they can be enjoyed as a healthy and quick snack. Combine all ingredients in a food processor and pulse until well blended and creamy. Serve with vegetables and pita wedges. Sauté edamame in olive oil for a few seconds, then add onion and cook until translucent. Add red pepper, corn, leeks, and garlic and sauté until vegetables are just tender. Spoon vegetable mixture into a bowl and stir in basil, tomato, and salt and pepper. Top with feta cheese and chill until ready to serve. Cook edamame in a pot of boiling water until tender; drain and set aside. In a separate pot, combine garlic, teriyaki sauce, brown sugar, vinegar, and oil and heat until a sauce is made, about 5 minutes. Add edamame to pot and stir well to coat. Spoon edamame into a serving bowl and sprinkle with sesame seeds. Serve warm or room temperature.